Dawn of Darkness - Collection 6 - "Heroes of Durgeth"
attacked, Kiova draws a rune-engraved sword and sings out in a clear and icy voice. Her song is a hymn of battle; its words bear an ancient magic. 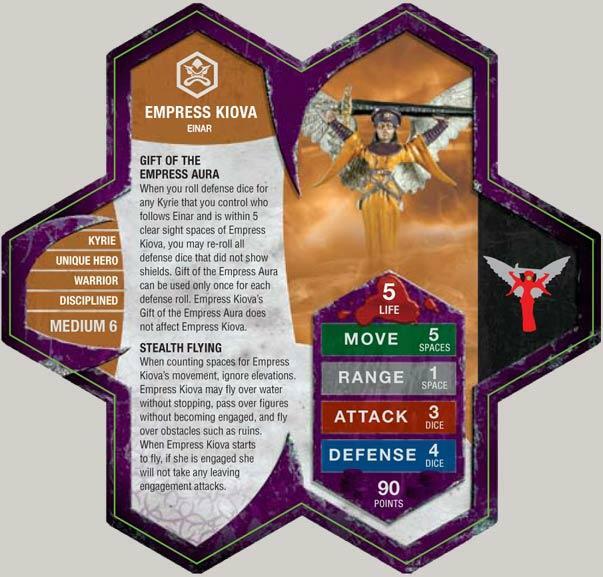 Does Empress Kiova have disengage when walking? *NOTE: See The Book of Sacred Band for proper application. Last edited by superfrog; March 21st, 2019 at 02:28 PM. Another to go in my 'probably won't ever use' pile. The only Kyrie I seem to ever use is the healing and defense girls. (who'se names escape me for the moment). Maybe that'll change when I get a chance to use my EI. you're thinking of Kelda and Raelin. They're the only kyrie I use with any regularity as well - of course I've yet to obtain Saylind or Concan, so that might be part of the reason. I use Taelord from time to time, but he's so gosh darn expensive. I don't have enough Minions (one squad) to justify Runa (she's a good decoy to play off of them) or Imperium (one squad) to justify Kiova yet. But it seems like both would become more valuable with more of the common squad they work well with. I find Two Einar Imperium combined with Realin and Thorgrim makes their army quite hard to kill. My brother used Grimnak against them but then I just charged them in and killed Grimnak. I held off his whole army with those five people and their wings help shield Realin and Kiova from ranged attacks. Imperium + Kiova + Raelin sounds like a great combo! Unfortunately because i usually play random drafting with my dad most of the time one person gets the Imperium while the other gets Kiova! I thought Empress Kiova was priceless until I realized that Gift of the Empress Aura only applies to kyrie... she's still pretty cool, just not as useful as I thought she was. My Indiegogo Campaign! Even $1 can make a difference! PayPal and credit card accepted! If you consider all of the Kyrie heroes in and of themselves - i.e. isolated from their allies - then Kiova is the second best, next to Concan, on raw stats. Don't count their non-flying powers (if they are more than 4 spaces from allies these don't count), and Kiova is attack 3/defense 4, Concan is attack 4/defense 4, while the others are all worse than Kiova (3/3 or 2/3) and none of them have Stealth Flying. Yeah, a unit that boosts the defense of a single non-ranged squad doesn't seem useful to me unless there is some kind of bonding. Although if I were going to pick one non-ranged squad to receive a hero who helps their defense and has no other use, I don't think I could pick better than the Einar Imperium. These aura Kyries certainly shine in a high point siege scenario. Empress Kiova, Raelin, Marcus, and 3 or 4 squads of Einar Imperium. (The imperium are good for castle sieges where the defender has figures on every hex of the castle top, say with 4mass raining down death. And Taelord is good for one of the other attackers to give that +1 boost to attacks in an attempt to break an opening in the castle top. This has worked for the attacking force in the last few games of this scenario that we have played. I guess my point is, in a large siege scenario, where the attackers have many points to spend, it is more about getting a good combination of units that can break through the castle's defenses. (Because if not, eventually, all the attackers' points will slowly be killed by the ranged fire from the top of the castle anyway.) And the attacker shouldn't worry about the Kyries getting shot at first, because if the defender is shooting at the supporting kyries, then the defender is not shooting at the actual attacking units. Very nice. After finally getting a match in with her, I can honestly say I like her. She could only help the Imperium's ferocity, and once they were gone, she could still hold her own with some height and her good defense. Plus, a VERY nice sculpt. Her vs. Kee-Mo-Shi on a bridge over lava... epic looking stuff. Is (classic) raelin better for the Imperium than Kiova?